Do You Need an Immigration Physical? If you’re seeking a Green Card and you’re in need of an immigration physical, we can help. Enter your name & e-mail address and we will send you New Patient forms. Download them and fill them out, It will make your first visit to Medics USA faster. During your exam, one of our physicians can answer any questions you may have. He or she will also ask you questions about your medical history and any immunizations you may have had in the past. We’ll also conduct a physical exam and draw a small amount of blood. At the end of the day, Medics USA is here to help you get the exam you need. Learn more below or feel free to contact us today with any questions. Why Choose Our Medical Clinic for Your Immigration Physical? Medics USA has personnel who are authorized by U.S. Citizenship and Immigration Services (USCIS) to perform immigration physicals. These immigration medical exams are required for anyone seeking a Green Card or adjusting their status to permanent U.S. resident. Medics USA has been providing immigration physicals in Northern Virginia and DC for many years, and we will help ensure that you comply with all necessary requirements. 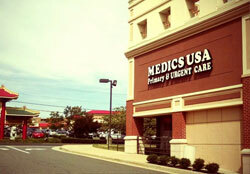 Immigration physicals can be scheduled at any Medics USA location by appointment. Find an office near you. What must I bring to the exam? Then please go to our page Frequently Asked Questions About the Immigration Exam. If you need a copy of the latest I-693 form, then you can download it here. Using black ink, please fill out the first page completely. On all the remaining pages, please fill out your name and A-number (if applicable) at the top of the page. The Medics USA provider will fill out the rest of the form at your exam. Enter your name and e-mail address and we will send you Form I-693, which you will need to fill out before your physical. Costs may widely vary. Please go to our Frequently Asked Questions About the Immigration Exam page for further explanation. Also, note that Medics USA does not submit the cost of immigration physicals to any health insurance plans, so we require you to pay the entire cost of the physical at the time of the exam. ©2019 Medics USA | All rights reserved.